These are semi-regular updates from our snow day. Since I’m going to be getting cabin fever, the least you can do is read about it! 9 am – woke up to a windy, white world. It’s hard to tell with the blowing snow, but I’d say there’s considerably less snow than predicted. This looks more like 6 – 8 inches than 18. (Note the lower portion of the fence.) Not saying we should be having school today, by any means. Everyone is now on a screen – Mom and Dad are working, Grey is on his Chromebook and Thane is watching Wild Kratts. 10 am – Adam made four hot loaves of fresh bread for our neighbors, to help keep starvation from the door. I invited the older kids over to entertain our kids with a rousing rendition of HeroScape. Then I realized that people probably needed to be able to, you know, get to our house. So I grabbed a shovel. The snow on the stairs was taller than the door, but powdery and easily pushed aside. I cut my way to the road, noting that the front yard snow was waaaaay deeper than the back yard snow – the promised 18 inches at least! The snow filled it even as I cut it. I got slightly stymied by the plow berm, but then decided my friends have legs and they could step over it. Great thing about elementary schoolers is that four of them are less work than two of them…. 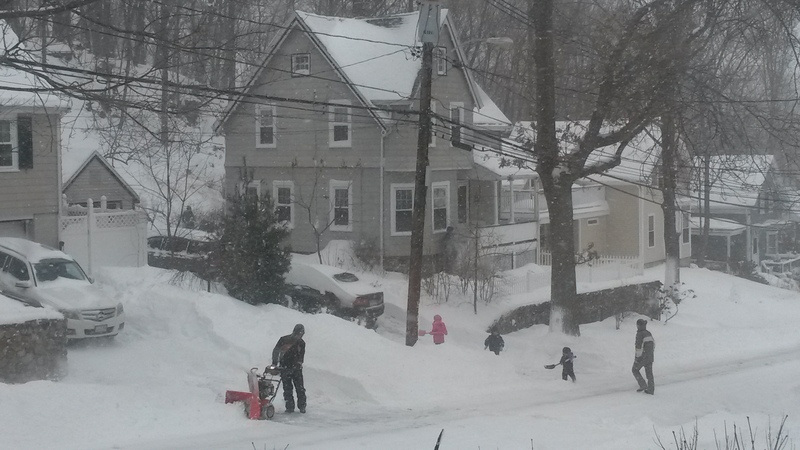 Snowstorms make getting to your neighbors a logistical exercise. 11 am – the kids read and played quietly for an hour, but then they spotted other little heads on the street, and booked it to get their snow gear on. Let’s all take a minute to appreciate having kids who can put on and take off their own snow gear without parental intervention… ah…. 1 pm – We went out sledding at noon. The DPW was attempting to plow our street, which was a bad combination. They asked us to stop sledding, so we did. 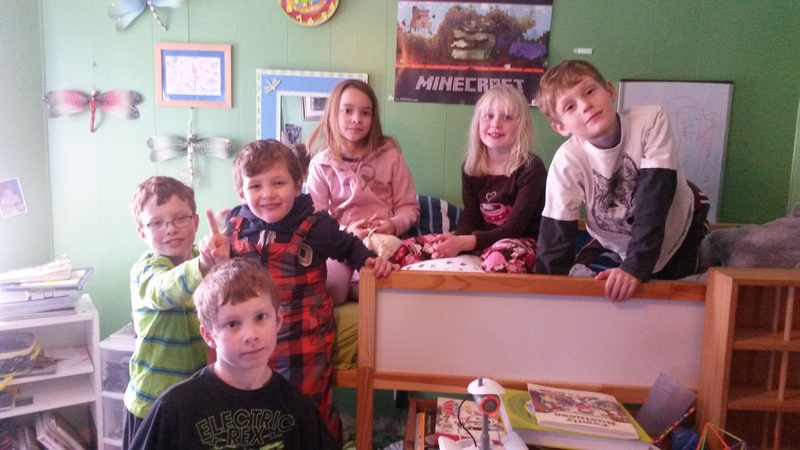 I took most of the older kids in the neighborhood, and they’re currently wreaking havoc in Grey’s bedroom. Grilled cheese for lunch! 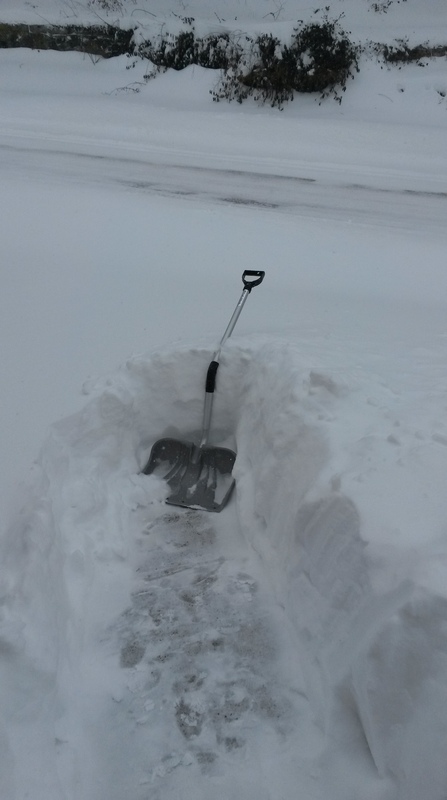 2 pm – I found the snow from the back yard. It was all on top of the cars. A million thanks to both David and Tobin for the snow-blowing. The snow removal on this driveway is a classic reason you should never buy houses during glorious October weather. 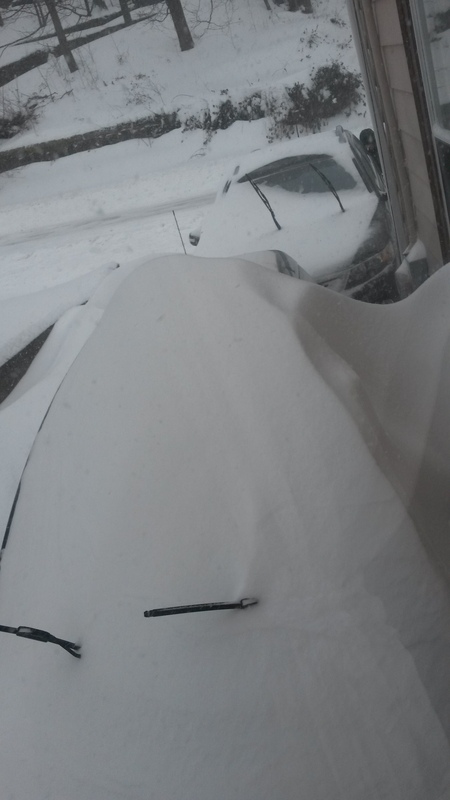 There’s a car under there. Somewhere. 4 pm – Nothing like a day at home with your children while trying to do a full day’s work to make you really grateful for school. It’s just about time to stop splitting my personality and being full time at home! 7 pm – Best possible way to end a snow day! 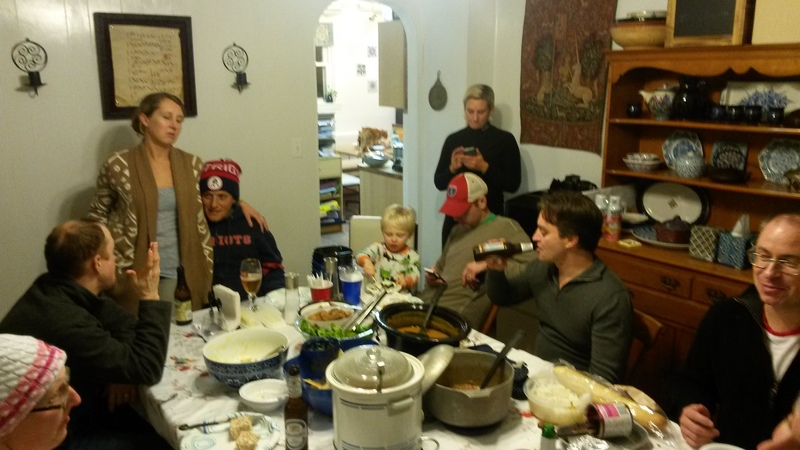 10 pm – friends have returned to their home and our house is returned to a semblance of order. And yet it snows. Pray tell..that white stuff of which you speak is called snow, in truth?